Manel Bosch is one of those painters who while part of his environment is able to give a distinct personality to his work. They appear to surrender to what has already been done, but in fact they undertake the difficult task of understanding it for themselves and transmitting to others the reason found in aesthetics and motivations in life. Born and educated in Montgat, a small town on the Maresme coast, where maritime themes blended with industrial ones, Manel Bosch found in the ever changing colors of the Mediterranean, in the clouds that hovered in a sky that was tainted with the haze from factory chimney stacks, and in the light that strained to be pure amidst the difficulties that arise from having such a populated city as Barcelona close by, his artistic motivation. He has developed his art mainly in Catalonia where there is such a wide variety of landscapes both coastal and inland; urban landscapes with their large solid buildings, and small towns whose whitewashed houses appeal to the pure intentions that beat in the heart of most people. Instinctive and yet rational, Manel Bosch knows how to capture the vital significance of the sun, where early in the morning, its light begins to move along the roof tiles of an old farm house, warming ideas of historical continuity. At the same time, he understands the strength of the rocks along the coast, that resist the pounding of the waves, because as one knows, at other times they will be caressed by them. Likewise, he captures the mood of the sun –always as natural light, one of the characteristics of his paintings– a sun that is setting and on a winter’s afternoon warms the façades of a row of houses in the Barcelona Eixample. The impressions become increasingly developed as they grow within paintings that are well constructed, agile in their concepts and confident in their consolidation on canvas. A painter of the natural –of the few that prefer the inconveniences of looking for a theme and representing it as it is– Manel Bosch represents forms of social life through his work. His paintings speak to us about the gains of understanding one another and of preserving the environment as sources of pleasures that are both simple and yet necessary. JOSEP MARIA CADENA. Barcelona, 1954. Journalist and art critic. He worked as editor in chief and responsible of art criticism for the newspaper El Periódico de Catalunya. He was awarded Creu de Sant Jordi by Generalitat de Catalunya and the prize Ciudad de Barcelona for his journalist performance. He was deputy director of the Catalan newspaper Avui and the editor of Hoja del lunes of Barcelona. He gave some lectures at the Faculty of Media Studies of Universitat Autònoma de Barcelona and has been an executive member of Barcelona Press Association and the Catalan Official Association of Journalists. 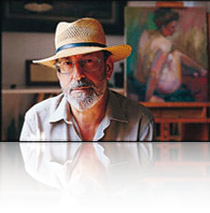 He has published more than fifty books on contemporary art.